Based on Disney's 1994 smash-hit film of the same name, The Lion King continues to be one of London's most popular musicals. Opening at the Lyceum Theatre in 1999, the show has since enjoyed sell-out audiences from around the world, who are moved by the unforgettable story, inspired score and outstanding special effects. 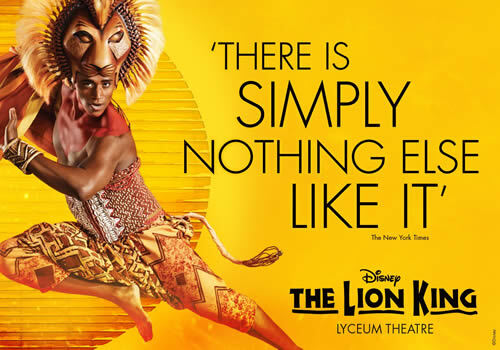 Brought to life by director Julie Taymor, the African Savannah unfolds in London, using breathtaking puppetry, costumes, dance and music to create the ultimate entertaining evening. Elton John and Tim Rice's heart-soaring score includes songs that audiences will recognise from the film, such as "Circle of Life" and "Can You Feel the Love Tonight", as well as extra numbers unique to the show. When it comes to The Lion King, it seems one visit isn't enough. It's not unusual for audience members to return to see this colourful show again and again. All numbers can be reached for bookings and booking inquiries Monday to Saturday 10am- 6pm The Lyceum Theatre’s box office is located within the theatre building on Wellington Street and is open Monday 10am – 6pm, Tuesday to Saturday 10am-8pm and Sunday 11am-3pm. If you have opted for ticket collection then you can pick up your tickets from the box office on the day of the performance at any time before the show. Built on one of the oldest sites in London, the Lyceum Theatre sits on a site that originated in 1765. In its early years, small musicals and circus acts were shown, and it was also the first home to Madame Tussaud's waxworks exhibition. In 1809, the theatre became home to the Drury Lane Company after the Theatre Royal Drury Lane burnt down. After this, the venue transformed into the English Opera house, staging a London premiere of Mozart's Cosi Fan Tutte. Sadly, similarly to the Drury Lane Theatre, the Lyceum burnt down due to the gas lighting. The Lyceum Theatre as we know it now was built in 1834 and continued to stage English operas such as The Mountain Sylph (1834). Towards the end of the 19th century, the Lyceum began to stage plays and farces such as A Tale of Two Cities and John Maddison Morton's Box and Cox. It was also during this period that actor Henry Irving made a name for himself in productions such as The Bells and The Pickwick Papers. Following a number of successful melodramas in first part of the 20th century, the theatre went dark for over a decade from 1939, closing with an acclaimed production of Hamlet, starring John Gielgud. Reopening in the 1950's, the Lyceum was transformed into a ballroom, hosting several concerts. It did not become a theatre again until 1985, when the National Theatre's The Mysteries played. Unfortunately, this was not enough to salvage the theatre's reputation, and the Lyceum once again went dark in the 1990's. Things picked up in the late 1990's, with big musicals such as Jesus Christ Super Star (1996) and Oklahoma (1999). It was not until the end of 1999 that Julie Taymor's now hugely popular The Lion King premiered at the venue, receiving two Olivier Awards in the process. Achieving unprecedented success, The Lion King continues to play at the venue to this day.